We would like to say a massive thank you to Steve Luther, Chief Engineer onboard DSV Mermaid Endurer, who instigated a roll of fundraising for the Myotubular Trust. Steve became aware of the Trust via his wife’s cousin, Clair Durston, whose son, Daniel, had myotubular myopathy. Daniel was the inspiration behind Steve’s fundraising. And a heartfelt thanks also to Mermaid Offshore Services, Allan Nairn (Bibby Offshore Project Manager), Bibby Line Group and the crew who so generously supported the Trust and who between them raised a fantastic amount. 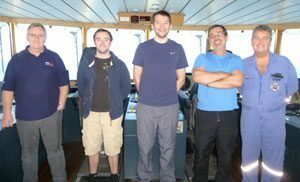 Steve told us, ‘The vessel was out working when we received an e-mail to inform us that due to our excellent safety figures our company, Mermaid Offshore Services, would be donating £900 to a charity of our choice. Allan (far left) with Steve (far right) and other crew members of the Mermaid Endurer. He continued ‘I was introduced to the Myotubular Trust at the funeral of Daniel Bell and afterwards by the work done by his mother Clair Durston so when asked for a charity I had no hesitation at putting the trust forward. I happened to mention this to Allan Nairn who is Bibby Offshore Project manager onboard our vessel and he kindly mentioned that his company Bibby Line Group had a charitable scheme where they would match up to £1,000 any donations made by crew onboard the ship. I posted a few flyers around the vessel with a brief explanation about Daniel and what the trust involved to see if anyone would like to donate from their own pockets. When the final count was made I was very grateful, to announce that we had collected £900. A big thank you was passed around from me especially to our Filipino crew who had also donated. The Myotubular Trust would like to extend our huge appreciation to everyone involved in the fundraising and for the kindness and generosity you have given us.